For the best outcome, fewer headaches and a higher likelihood of staying on the budget put more time into planning. It can be easy to get caught up in the excitement of creating a new space. So, before you start wandering up and down the aisles of your local home box store searching for the ideal tile to go with the perfect faucet you saw a few weeks ago, sit down and determine your budget. Then take at least twenty percent and set it aside for the inevitable surprises that will arise. 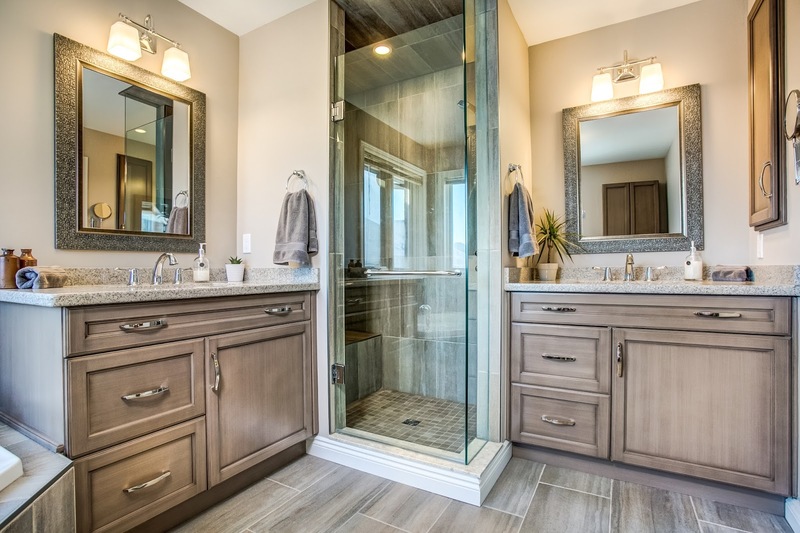 According to the National Kitchen and Bath Association (NKBA), you should expect to spend between 5 to 10 percent of your home’s value on a bathroom remodel. Once your budget is in place, find a contractor. Bathroom remodels can look deceivingly simple. They’re small rooms that have tricked many a weekend warrior into visions of DIY savings, only to have those dreams crushed by the complexities involved. Plus, you’ll have the added expense of the contractor having to fix your mistakes. It’s best to know your limitations, only do tasks within your skill set and leave the rest to the professionals. When you do speak to a contractor get a separate quote for labor and materials. Before signing the contract, check to see if you can find materials for less. Whether you purchase the materials yourself or let the contractor do the shopping, have everything purchased and delivered before the remodel begins. This will avoid delays, a possible increase in labor costs. Once the materials are purchased, delivered, and work has begun, step back and let the professionals do their thing. Don’t continue to look at fixtures, tiles and paint color. Making changes once the remodel has begun will be costly and cause the project to take much longer. Unless there are problems with the products that were purchased, don’t drive yourself crazy second-guessing your original choices. Small bathrooms aren’t as costly because there are fewer plumbing fixtures and lesser square footage. To stay within a low budget, keep the original bathroom layout as is. Moving plumbing, electric and walls will cause the remodel to become expensive quickly. If the original fixtures, cabinetry and surfaces are in good condition, consider refurbishing instead of purchasing new, low-quality materials. Surfaces in bathrooms take a great deal of daily abuse that include multiple climate changes. Did you know? Using sub-par materials can end up costing you more in the long run. For example, if you decide to paint the walls yourself, use mold and mildew resistant paint or primer. It may cost more than regular interior paint, but you won’t have to redo it in a year. If fixtures can’t be saved, they must be replaced. The average bathroom remodel falls within the mid-range level. This type of renovation may include a larger bathroom and replacing existing fixtures while keeping them in the same location. Homeowners can choose to either purchase replacement fixtures that fall within the same price range and quality, or pick and choose where to splurge. If you hate stepping onto cold floors after a relaxing shower, consider having heated floors installed, and save money on other purchases. If you live in an older home, replacing outdated tiles may be of more importance. 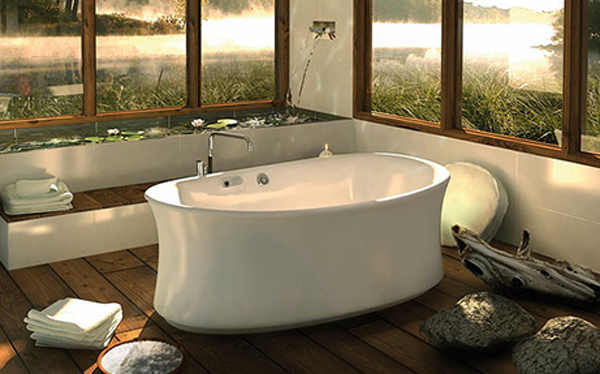 If you’re priority is to go green, installing low-flow faucets and toilet will be your focus. A deluxe bathroom remodel is typically done in a master bath suite. As a larger room with more fixtures, this will automatically increase the cost. This type of remodel takes a room that’s purely functional and turns it into your own personal oasis. 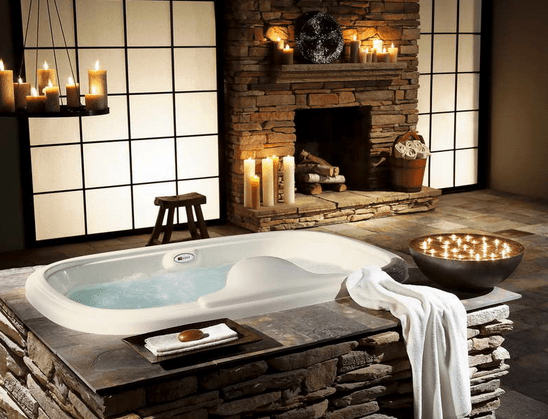 Depending on your needs and desires, you may want to create a spa themed bathroom with a luxury soaking bathtub and a walk-in shower with a fireplace. Perhaps you’re a newly married couple and would like a bathroom to fit both your and your significant other needs with a double vanity sink, Jacuzzi tub for two, and a large shower with multiple shower heads. If you’re making your home environmentally friendly, you may be in the market for a stylish low-flow toilet, bamboo flooring, and motion sensor faucets. These are only suggestions and breakdown of costs if everything is replaced. Depending on the size, type of bathroom and your location, the numbers above will vary. Estimating the price of a bathroom remodel is more difficult than other types of home improvement projects. Not only do bathrooms greatly vary in size, but also in the number of fixtures. Lance McCarthy of ReTouch, has devised an alternative formula for estimating the costs of remodeling a bathroom. In his video, he explains that his formula is based on the number of “holes” or fixtures a bathroom has, then increases the budget when higher end materials are used. A bathroom with a tub, toilet and single sink would have three fixtures. He estimates an average remodel will cost $3,000 per “hole”. So, a basic 8’x9’ bathroom with three fixtures would cost $9,000. He creates a base rate for the products used by dividing the above number in half. So, for base grade fixtures, set aside a budget of $4,500. This number will double as higher quality materials are used. He uses the same formula to estimate the cost of a master bathroom with a toilet, shower, tub, and double vanity. This is a bathroom with five “holes” or fixtures. As you can see there are different ways of approaching and planning a bathroom remodeling project. Whether the goal is to increase the rate of return on your investment, or you’re making improvements to your forever home, breathing new life into an outdated bathroom adds value. Of all the rooms in a house, the bathroom needs to be functional as well as comfortable and stylish.